Loudness levels? 2 masters? What levels do you aim at? Discussion in 'Mixing and Mastering' started by Triple, Oct 31, 2018. Do you master your song so that it reaches e.g. -6dB RMS on a CD, and then you make a more dynamic mastering version for streaming and online stores which reaches e.g. -10dB RMS? Do you use this site? Firstly, current standard is LUFS, not RMS and you can find several LUFS meters for free. There is no thing like an overall/general LUFS target for music. Classical music and a lot of other genres generally have much lower LUFS than pop, EDM or Heavy Metal. So, the appropriate LUFS value depends on the track. Different platforms have different LUFS targets and they can change these whenever they want and to any direction they want (up or down). I try to avoid to master a song with less than -12 LUFS, I think it sounds dead if it's louder. All platforms with a LUFS target (iTunes -16, YT -14) will lower a track's volume when played (as long as it's higher, of course) but not affect the original dynamics. So, if you buy it, it should have the original LUFS value. And no, I don't use this site you linked. If you have a LUFS meter and know the LUFS target of the different platforms it's just not necessary. in my case, the mastering studio i work with requires me to deliver them audio material in 44.1khz / 24bit wav files* with a LOUDNESS/*DYNAMIC* RANGE margin of at least 6db or more! ...and yes, when you open up the file in some audio editor, the graphic representing the spectrum wave may look very tiny and it sounds very much "low volume". and this is exactly what the mastering studio needs! this offers them a larger "maneuvering margin and range" to refine dynamics, limit/compress/expand (if and what's needed) and equalize, when the "cooking" is done and it does SOUND great, then they can apply to the final product any "loudness" they want or need! and i don't even care about the "loudness" because it is what the mastering studio does for me and then it gets even further processed when it is being released on popular media platforms (internet, tv & radio) ..
the what should matter is the SOUND of your production, not its loudness! Most of the platforms don't go out of their way to monitor and enforce their said loudness standard. For example, Spotify is supposed to be -13 LUFS.. and 99% of everything recent on there has a range between -10.5 and -11.5 LUFS. And YouTube having a standard of -14 LUFS is obviously not met. It probably only holds true if you have an exclusive marketing deal with a platform. Anyone can sell their songs/albums on iTunes. Generally, it's just an mp3 version of the master that gets submitted. And just about everything has a peak of 0 or -0.1dB when it's submitted regardless what the loudness average is. Btw.. LUFS is a better measurement for albums in modern times than RMS is. It deals with perceived loudness rather than just channel pressure. RMS matching makes it so if you had a club track followed by a slow jam with just an acoustic guitar.. the slow jam would murder your eardrums if they were the same RMS. I don't use average RMS. I aim at -12 to -10LUFS. Most platforms normalize to around -14, but I still think -12 to -10 sounds a bit better (depending on master/mix/genre/style/etc). I can take some loudness penalty. I also leave about 1dB of headroom on the master (at -1dBTP), to avoid additional ISP during lossy conversion. Spotify suggests 2dB of headroom. I also leave about 1dB of headroom on the master, to avoid additional ISP during lossy conversion. Spotify suggests 2dB of headroom. Hey look Ma, I done good...or not? You were, are and will ever be the best. But Spotify does loudness normalization, if you have that option turned on (which I like to have). I see that's a big image. So, apparently 99% of those on Spotify aren't very fond of the normalization option. I'm glad to be aware of that, because I'll be sure to keep that option turned off if I put anything up on Spotify so it can "survive" on there. Get back to me in 5 years and let me know if you think the same then. The whole point of loudness normalization is that all dynamic ranges will "survive" amongst each other. Preservation of the dynamic range is why I've avoided loudness normalization for a long time. Im a modern jazz head so I don't like anything sounding cold or restrained. I meet the LUFS target for each song individually rather than use a tool that's going to either brighten or darken one song in attempt to auto-match it to another. Peak normalization isn't so destructive, but loudness normalization is destructive as hell. 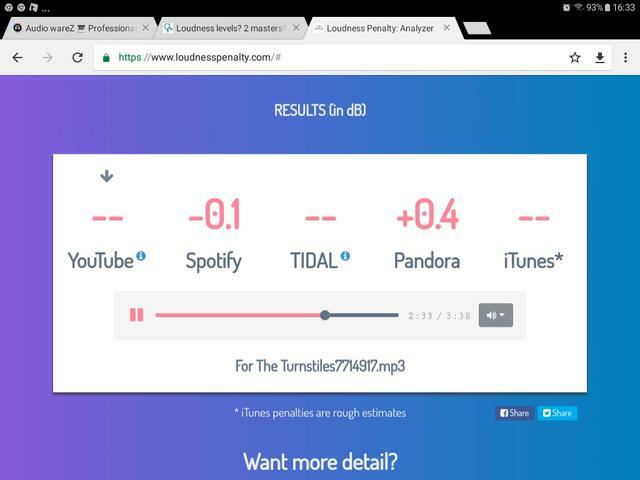 Reading back, it sounds like you missunderstood what loudness normalization is. Maybe I'm wrong. 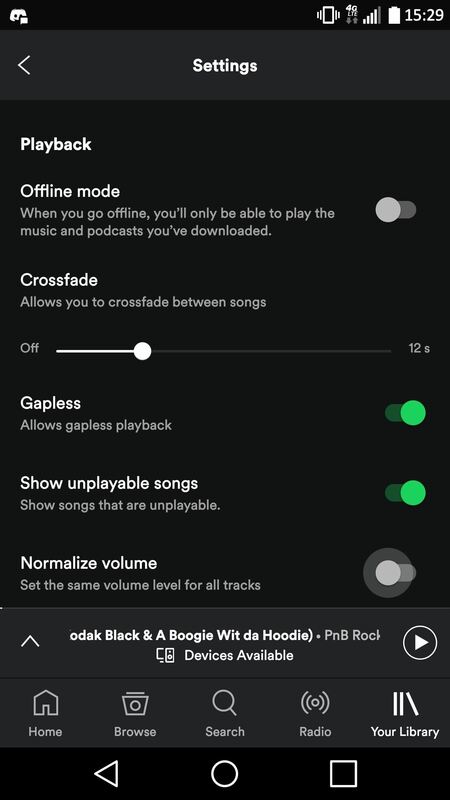 Spotify does loudness normalization, if you have that option turned on (which I like to have). I just like dynamics. I hope for the loudness war to end soon (so I embrace loudness normalization). But that's just me. Reading back, it sounds like you totally missunderstood what loudness normalization is. Maybe I'm wrong. There is peak, RMS, and now even LUFS normalization. In that same order there is a difference between volume, gain, and perceived loudness. Peak normalizing all songs to the same peak is not going to alter the dynamic of any of the songs or match the perceived loudness of them at that peak. RMS and LUFS (loudness) normalization screws with the weight and the crest factor of the songs in addition to the just the peak. It will either compress or decompress songs to match their target, and that is totally destructive.